If you operate a boat with a piltohouse or enclosed helm, chances are parts of its superstructure impede your view aft, making docking and low-speed maneuvering stressful. A small Florida company offers an alternative: the Yacht Controller, which brings precise, low-speed docking control to conventional shaft-driven boats. It’s a wireless system with a remote helm control that electronically interfaces with the boat&apos;s engines, transmissions, thrusters and anchor windlass. With Yacht Controller the skipper can leave the helm and manipulate the engine and thrusters from the bow, stern or any spot on deck to maneuver into a slip or to a dock, says Gerard Berton, president of Yacht Controller, of Coral Gables, Fla.
Click play to view a presentation on the Yacht Controller. Not only does the Yacht Controller eliminate sightline issues, but it also allows the captain “to tie the boat up alone since he can step off with a line in his hand and use the Yacht Controller to keep the boat in place or move it,” says Berton, who introduced the system in the United States in 2003. The company has sold 6,000 Yacht Controllers since it launched the product. The Yacht Controller connects to a boat’s electronic controls. A local dealer can install it in a few hours because it is a plug-and-play system, Berton says. The company has equipment for more than 35 types of electronic controls, and the setup does not bypass any original equipment systems or require any cutting or splicing of wires, he says. 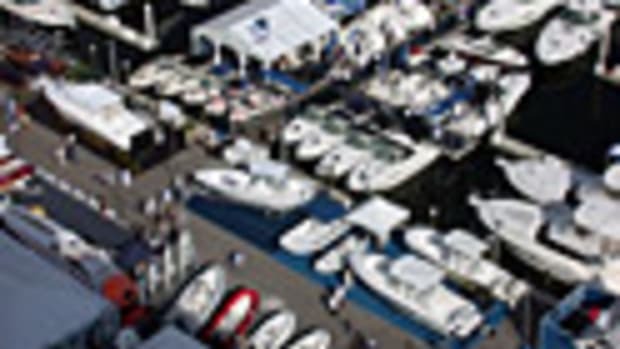 The Yacht Controller has been installed on more than 136 boat brands to 125 feet. The system retails for $10,000 and includes the electrical harnesses, the receiver and the transmitter. Dealers normally charge an additional $1,200 to $1,500 for installation, Berton says.